Northern California's aggressive Valley Fire, which killed at least one person, destroyed 585 homes and sent residents fleeing along roads where buildings and vehicles were engulfed in flames, surged to 62,000 acres — or 95 square miles — on Monday. Cal Fire officials said at a press conference Monday that the fast-moving wildfire that raged through communities in Lake, Sonoma and Napa counties over the weekend was only at 10 percent containment. Hundreds of other structures are known to be destroyed as well, according to Cal Fire. "Whether you're a rookie firefighter ... or a seasoned veteran, everyone is saying the same thing: we have not seen fires spread and move in the way they're moving in this case," Cal Fire chief Ken Pimlott said. Cal Fire on Sunday confirmed one fatality in the Valley Fire that raced through dry brush and exploded to 40,000 acres in less than 12 hours. The agency couldn't provide details on the circumstances of the death. 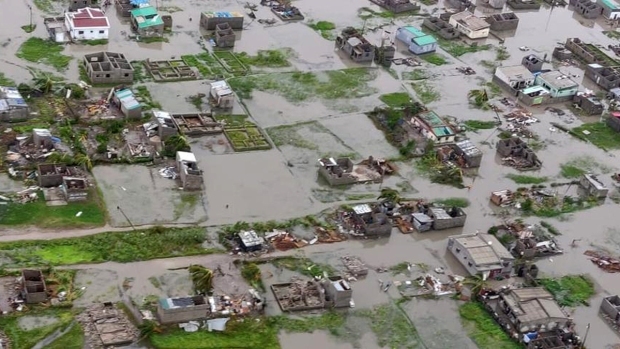 Officials also said Monday that over 13,000 people were forced to leave their homes and several more remain unaccounted for. Pimlott blamed the state's historic drought and higher-than average temperatures for making vegetation drier. "We won't see an end to fire season for months to come ...We are all engaged in this firefight," he said. In addition to the homes, officials also counted two apartment complexes and 10 businesses destroyed by the flames, department spokeswoman Lynn Valentine said. A call to the Lake County Sheriff's office wasn't immediately returned. 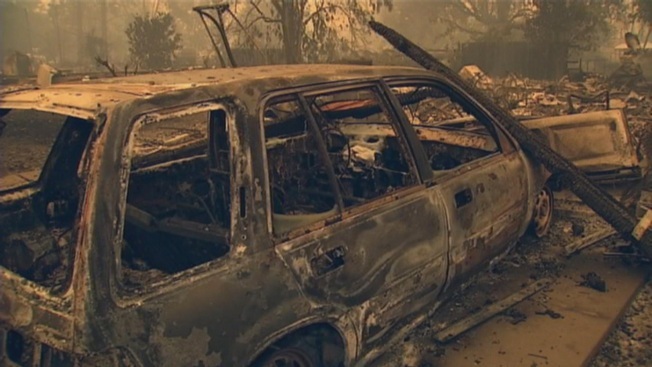 Just In - The #ValleyFire in Lake,Napa&Sonoma counties has now burned 61,000 acres & 5% contained. Structure damage on the #ValleyFire still remains at an estimated several hundred homes & hundreds of other structures destroyed. Up to 1,000 structures such as barns, sheds and other outbuildings were burned, Cal Fire spokesman Daniel Berlant said. As of Monday night, 7,200 people were without power, PG&E officials said. The blaze erupted Saturday afternoon and rapidly chewed through brush and trees parched from four years of drought. Entire towns as well as residents along a 35-mile stretch of State Route 29 were evacuated. Gov. Jerry Brown on Sunday declared a state of emergency to free up resources. According to Cal Fire officials, 1,255 firefighters are battling the flames with the help of 117 fire engines, four airtankers, 10 helicopters, 24 dozers and 49 water tenders. Evacuations were also ordered in Pope Valley as well as in communities of Middletown, Hidden Valley Lake, Clearlake Riviera, Riviera West, Cobb, Seigler Canyon, Loch Lomond, Point Lakeview, Soda Bay and others. Evacuees took shelter at Napa County Fairgrounds in Calistoga, the Highland Senior Center in Clearklae and the Kelseyville Presbyterian Church. Meanwhile, Howell Mountain, Pope Valley Elementary and Lake County International Charter schools were closed Monday. All Lake County schools were also shut as were the Middletown and Kelseyville unified school districts and Yuba College campus in Clearlake. Teri Molini said she first heard word of the fire Saturday afternoon and raced out of her house with the family dog, blankets and mementos. Four hours later, she could see the flames from where she sought shelter. "We said, 'OK, this thing's a beast,'" Molini, 53, said. Whole blocks of houses were burned in parts of the town of more than 1,000 residents that lies about 20 miles north of Napa Valley. On the west side of town, house after house was burned to their foundations, with only charred appliances and twisted metal garage doors still recognizable. Firefighters on Sunday afternoon could be seen driving around flaming utility poles to put out spot fires. Homeowner Justin Galvin, 33, a firefighter himself, stood alone at his house, poking its shin-high, smoking ruins with a piece of scrap metal. "This is my home. Or it was," said Galvin, who spent all night fighting another massive fire in the Sierra Nevada foothills. Valentine said most of the destruction occurred in Middletown and Hidden Valley Lake. Numerous homes along the shuttered State Route 29 were also ravaged. In an update, Cal Fire officials said the Valley Fire was spreading due to "hot, windy conditions." "The fire continues to grow as firefighters work to construct fire lines, while protecting lives and property," they said. Per Todd Derum, CalFire Ops Chief, #ValleyFire creating own weather, not moving with the winds. Spotting out in all directions. Four firefighters who are members of a helicopter crew suffered second-degree burns during the initial attack on the fire. They remained hospitalized in stable condition and are expected to make a full recovery. "The bushes, the trees have absolutely no moisture in them, and the humidities are so low that we are seeing these 'fire starts' just erupt into conflagrations,'' Ghilarducci said. Meanwhile, a shift in weather was expected in the first part of the week as a trough of low pressure approaches the West Coast. The National Weather Service said that would mean a cooling trend with increasing winds, higher humidity and showers, then more widespread precipitation Wednesday. The week will end drier and warmer.